The example code can be downloaded at this link. 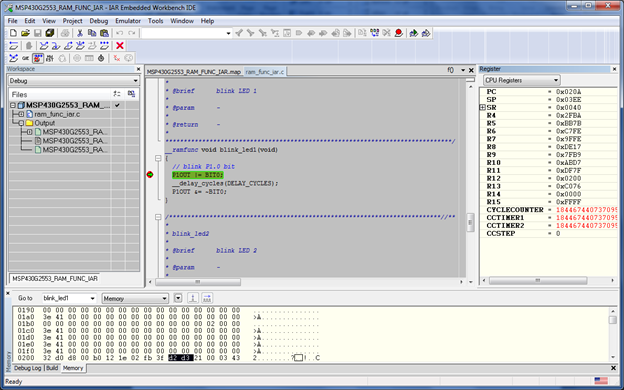 As can be seen above, the four functions defined with __ramfunc keyword are assigned to the memory address of the on-chip SRAM (between 0x200 – 0x3FF). 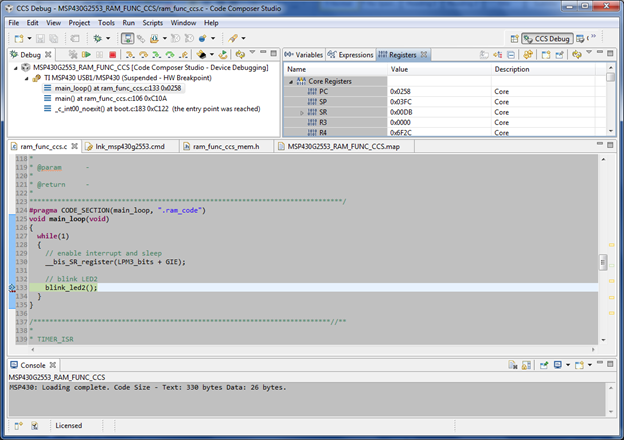 Using Code Composer Studio (CCSTUDIO) to implement RAM functions is a little bit more complicated. It requires the user to first define the memory area where the code shall be stored in flash and also executed in SRAM during run-time. As can be seen above, there are 128 bytes from each on-chip SRAM and FLASH memory which are allocated to store the RAM functions. The SRAM for storing the RAM function is defined at memory between 0x200 –0x27F (from RAM_CODE_START_ADDR to RAM_CODE_END_ADDR), while the flash used is between 0xC000 to 0xC07F (FLASH_RAM_CODE_START_ADDR to FLASH_RAM_CODE_END_ADDR). Awesome. Exactly what I’ve been trying to do to lower power in my system. Unfortunately I didn’t realize that my MSP430G2553 is rather limited in its memory, so I guess this won’t help. I’ve been following this MSP430 tutorial and didn’t realize until much later that to do this RAM capability I’d need a lot of RAM. Jane, you are correct. Actually running code from SRAM would make more sense for devices which has much bigger SRAM size. Anyway I decided to write it for MSP430G2553 since the MSP-EXP430G2 Launchpad is the most popular kit for MSP430. I want to write function into flash only but at specific address but it won’t work using CODE_SECTION and i am using CCS. I had forgotten that the end application had to manually copy code from flash to sram with CCS.